For all you brides out there who are looking ahead to your winter weddings, here are two winter flowers that are available to you in your season and together in no other season. 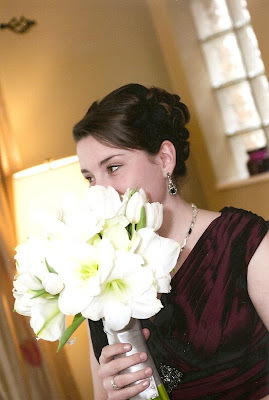 This bouquet has amaryllis and tulips- two very elegant and winter-y flowers that we LOVE together. 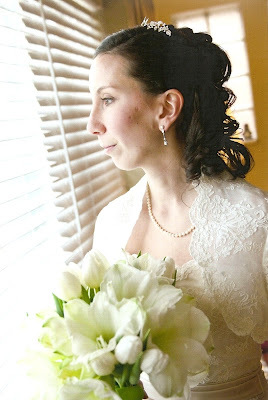 Take a look……..
Emily was our bride from this past January. She wanted a very simple, elegant look for her flowers. We suggested these two types of blooms to also give her flowers a seasonal feel without being too overdone. The amaryllis have a very large bloom and come in white, red, or burgundy. They are available from approximately November through mid-March. Mixed with the tulips or standing alone, they are an awesome flower that most people don’t think to use in their wedding, which makes them unique!